There are ordinary cars, and there are Porsches. Designed and built with a laser-sharp focus on overall performance, Porsche sports cars are a breed apart. The 2017 Porsche 911 Targa 4 GTS is a shining example of Porsche’s ability to craft unique, desirable, and highly capable automobiles. It was created for the serious driver who wants a harder-edged version of the standard 2+2 911. The 911 Targa 4 GTS is a higher-performing all-wheel drive model of the 911 in the Targa body style. Compared to the standard 911 models, the 911 Targa 4 GTS is enhanced with 30 more turbocharged horsepower for a total of 450. It accelerates from zero to 60 mph in 3.4 seconds and rides 10 mm lower on its sport suspension. Inside, the 911 Targa 4 GTS has supportive sport seats and a sport steering wheel covered in grippy Alcantara fabric. You can shift manually with its 7-speed stick, or choose the 7-speed PDK double-clutch transmission. 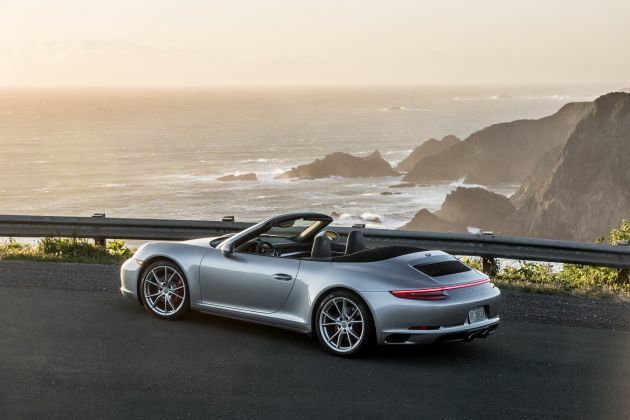 You can identify a 911 Targa 4 GTS by its black wheels, its black exterior trim, and its wraparound rear window, which raises itself above the body to let the solid roof panel retract underneath. The Targa body gives you the convertible experience without the wind buffeting, similar to having a very large sunroof. When closed, the Targa 4 GTS seals up tight to keep the weather out.